ok.......you win......this is the cutest frog cloth ever! Great job and can't wait to get out my lime green cottontots and cast on! Thank you! I have a nephew that loves frogs and I was wondering what to make him for Christmas... I declare problem solved. This is great. Thanls for sharing the pattern. I'll be looking for you on Ravelry as well, I am gimpykatk there. great froggie!!! My neph will love it! Thank you for sharing. You're the KPC pattern of the week! That's awesome, congratulations! I LOVE tree frogs so definetly going to make one. for row 7.. what do you mean by for all odd knit across? Would there be anyway somoeone could help me with seperating the parts of the pattern where the toes and eyes of the frog are? Ive been doing trial and error with it for awhile... i want to change the colors of some parts :) for my mother in law (she has breast cancer and she loooves frogs and will love this so much!) Ty!! I came here from The House on the Side of the Hill. I have just finished this froggy and he is too cute. Oh my gosh!! How cute! I raise tree frogs every summer so I really like this. 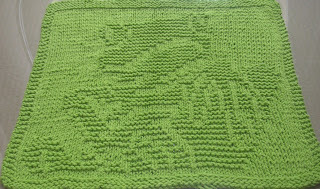 I finally found a frog that I want to put in my baby blanket. Thank you! It's so cute!